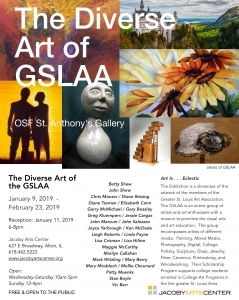 This exhibit is a showcase of the artwork of the members of the Greater St. Louis Art Association (GSLAA). Many of these members are also Best of Missouri Hands artists such as....Betty Shew, Diane Tesmann, Greg Kluempers, Jessie Cargas, Leigh Roberts, Lisa Hilton, Mark Witzling, Mary Berry, Mollie Chounard, Patty Muenks, Stan Boyle, and Vic Barr. The exhibit is located at the Jacoby Arts Center in Alton, IL and is open to the public till February 23, 2019.